This entry was written on Father’s Day 2011 at Busch Stadium while the Cardinals played the Kansas City Royals. ST. LOUIS – My plan was to spend the entire summer of 1994 establishing residency in Missouri and take full advantage of living in a college town without, you know, having to attend those pesky classes that interrupt college. I spent my mornings teaching swim lessons, my days working as a pool manager (read: lifeguard, but with better pay), and my nights sharing a house with a couple pals from the student newspaper, The Maneater. There wasn’t much sleep that summer, nor much money, but there was always something happening. My parents expected me to leave that for … Ten thousand lakes, the Mall of America, and free-range mosquitoes? They had moved from Colorado to Minnesota, officially, the previous summer and few conversations passed that year without a question about when I planned to drive up to Rochester, Minn., for a visit. I’d blame my work schedule, I’d waffle, I’d ignore their invites. It was their home, not mine. I had no emotional ties to the place, no friends to see when I got there and, selfishly, no reason to go back once I drove away for college. If I had to visit, I suggested a neutral site. We’d meet at the midpoint. There was this baseball field, in Iowa, about halfway between us. The Field of Dreams, a tourist attraction left over from the making of the movie, was situated on two farms just outside of Dyersville, Iowa. It was about a 3 ½-hour drive from Rochester and 5 ½ hours or so from the Mizzou campus in Columbia, Mo. We would converge one weekend on Davenport, Iowa, so Mom could visit her best friend, the minister who had baptized me in a bird bath more than 15 years earlier, and we’d drive together to Dyersville from there. This was back when I rarely left my room without a Yankees hat on, and never drove anywhere without two gloves and two baseballs in my car, just in case a game of catch broke out somewhere on the trip. And often it did – at a rest stop in Nebraska, at a gas station the middle of Kansas, and once in the parking lot of a Shoney’s in New Orleans during Mardi Gras while waiting for the next Krewe to parade by. For me, this was a pilgrimage disguised as a meeting with the folks. The night before going to the Field of Dreams we stayed up late talking at my Mom’s friend’s dining room table. Inevitably, with a minister at the table, the conversation veered toward the spiritual. My father and I were forced to discuss our increasingly diverging views of religion. Mine was full of arrogant youth and its invulnerability, his guided by advancing age and its insecurity. Two months later my grandfather, his father, would die and these discussions would soften in volume, but not change in content. There was not a lot we could agree on. It seemed like there rarely was back then. We always had baseball. We shared the game. I don’t recall many days from my youth that didn’t involve playing catch with Dad or shagging flies at the ball field that was a short stroll from our house. I was brought up on stories of Mickey Mantle and how evil the National League was for moving the Milwaukee Braves and Eddie Mathews to Atlanta. It was evil enough to make any God-fearing baseball fan stomach the DH. My grandpa taught me a lot about how the big leaguers play the game; my dad showed me how to play. He repeatedly told me about how you could tell where a fly ball was going or how well it was struck by the sound of the bat. I took this too literally. I would stand out in center field pinching my eyes shut until Pops hit the ball. Once I heard the crack, I was off, racing for the catch, still young enough to think I was decoding the noise off the bat like some keen safecracker and not, in reality, running after a ball I’d caught hundreds of times before from a hitter I seen take a thousand swings. Standing more 200 feet apart, we bonded – connected by the sizzle of a line drive I could only hear. It was because of our shared fondness for the game that I entered the lottery for tickets to the first regular season major-league game in the Mountain Time Zone, the day the Colorado Rockies came home to face the Montreal Expos. I wanted to go, sure, but I also wanted Dad to go. Actually, I wanted to take him. I won the right to purchase three tickets to the game and did so, pulling money out of a plastic Thundercats cup I used for a bank. My father and I were two of the 80,227* who saw Eric Young hit a home run in the first at-bat ever by a major leaguer we could call ours. I remember the specific attendance of that game as if it were my social security number or PIN, as if it’s part of my very numerical identity. * Written without the comma and 80227 is the zip code for Denver. Watching baseball was not something we did together all the time. We went to Denver Zephyrs games when possible, and we made a holiday out of the All-Star Game, but overall Dad was not one to sit and watch the World Series. I don’t recall him sitting beside me in 1989 as I meant to watch Game 3 of the World Series and ended up tumbling into journalism. But I do remember that always being my goal. My father felt jilted when the Braves left Milwaukee, felt sick with the rising salaries, soaring costs of tickets, and, in 1994, the gathering storm clouds for an eventual strike. I didn’t want him to turn his back on the game. He was OK playing it. Watching baseball too often crossed a line, as if tuning in was a tacit acceptance of the Atlanta Braves he was not willing to make. I made it a quest – still do, really – to change that. Going to Colorado’s Opening Day had to the potential to be magical and, I thought, certain to spark his pilot light. To me, the only thing better than playing ball with my dad was going to be watching ball with my dad. I realized on the drive to Dyersville that I may have invited another round in the ongoing debate of loving the game despite hating the business. A movie about the virtues of baseball had spawned a tourist trap. Pops loved his analogies and he would milk this one for every cynical drop. It was lucky then that as soon as we unloaded from the car a game broke out. We didn’t have to walk around the grounds, we didn’t have to watch, we didn’t have to revisit old debates, we got to do what he and I always preferred to do – just play. A couple college kids from Virginia took a detour to see the field. There was another group from somewhere else. We all had gloves, and the field was open. There weren’t enough people to make full teams, but we did well enough with a couple infielders, a couple outfielders, a pitcher, and a batter. There was no catcher. We weren’t up there taking. I don’t remember much about how I hit or whether I made any gems in the field. I do remember what dad did. I was in left field and one of the Virginia kids, sporting his UVA cap, was on the mound. He floated a pitch and by dad, batting righthanded and using a wood bat, turned on it. I had the best view of all as the ball peaked right above my head and began its descent into the distant corn for a home run. There’s no video of the homer, no iPhone there to capture it and upload it on YouTube, and there’s no need for one. I’ll never forget how it look. We learned by walking around the Field of Dreams that day that it was actually two fields, or rather two owners for the same Field. They apparently had different dreams. The Lansing family owned the infield portion of the Field and set up a souvenir stand not too far from home plate. The Ameskamp family had tried to turn their portion of the Field back into farming before surrendering to the tourists and putting left field back in place. They too had a souvenir stand, and we dutifully visited both and purchased a T-shirt from here and a color-change mug from there. More than a decade later, the Ameskamps would sell to the Lansings, but when we visited they were at odds. They shared this wonderful interactive acre of Americana, this Mecca for baseball, and it seemed if they had their way we would pay one admission to hit a fly ball and another to catch it in left field.There I stood on one side of the property line watching my dad launch a ball from the Lansing side deep into the Ameskamp’s corn. The stalks weren’t tall enough at this time of year to hide any ghosts other than Eddie Gaedel’s, so it didn’t take long to find the baseball. For years, that was the ball I kept in my glove because my father told me always to keep a ball in the glove to keep its shape. Always.So there was I was harvesting a baseball from the mud on the Ameskamp side while my dad stood at the Lansings’ home plate. Two owners shared a baseball field and couldn’t reach a common ground.That’s where we found ours. 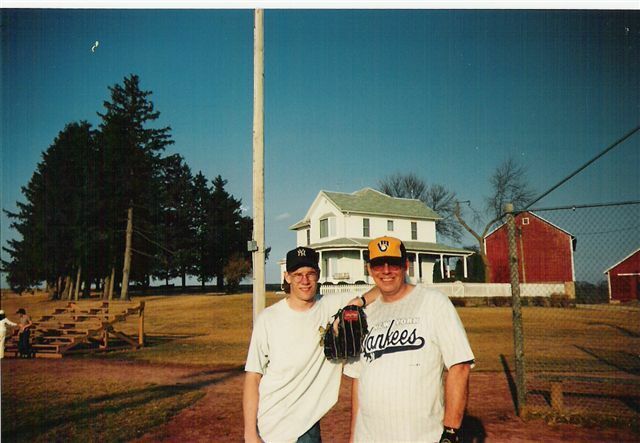 This entry was posted in baseball, journal, project 365+, travel and tagged baseball, dyersville, field of dreams by dgoold. Bookmark the permalink. I must have missed this piece last year in all the commotion of getting my son home healthy after being born 14 weeks early. I think this story will touch a very deep part of the soul of any boy who played catch with his Dad growing up. My son is a year old now and I’m pretty sure that only my dad understands why one of the very first things I bought him after he was born was a baseball glove. I know my wife thought I was nuts. Just to make sure I got it right I bought one lefty and one righty. Thanks for writing such wonderful and approachable pieces. Baseball was a big part of my stress relief over last summer and your writings are a big part of baseball for me.